SOKO stands for "Stylish,Original,Kindly and Odorless." down trees and thus leadsto the conservation of the forest. SOKO stands for "Stylish,Original,Kind and Odorless. 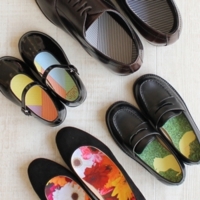 "This insole is a fashion item for KIDS. The base material is a thick CHEMIFELT BREATHE. picture of creatures. Please enjoy it in parent and child pair.